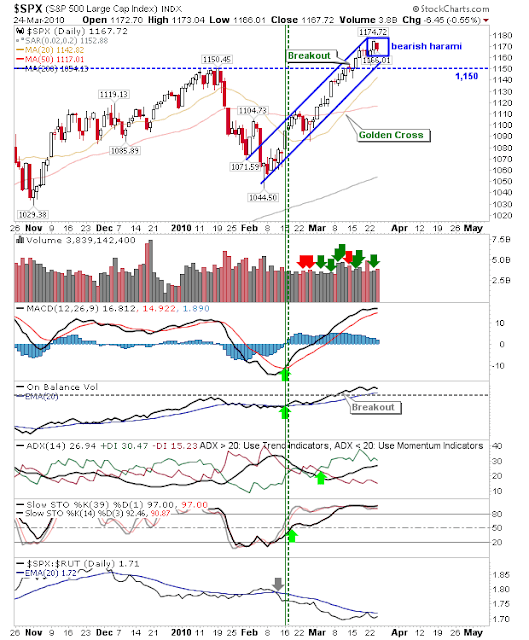 Stock Market Commentary: Semiconductors Break in Trouble? A late posting on this, but yesterday's downward action was not surprising given a mix of profit taking and fresh short positions prevented any further push higher. 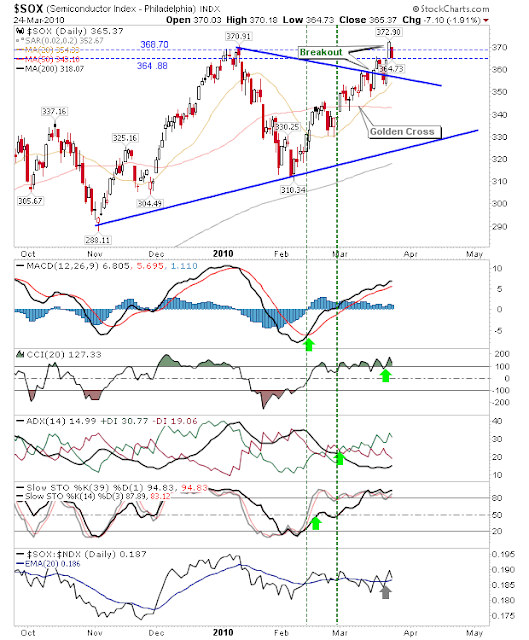 The semiconductor index took to the brunt of the selling and its new-high breakout is under threat with its close at the low end of a thick paint-brush-support level. In all likelihood the index will drop back to former triangle resistance-turned support. For other indices there were no real surprises. The S&P traded an inside day, potentially produing a bearish harami with selling volume trumping the prior day's buying. A move back to test support of what is a very narrow and acute angled channel would appear to be the setup for Thursday - although if the rally is to succeed in the long term it will need a channel less steep than the current one. The breakout stock - well ETF - for today is $EUO; given the turmoil in the Euro it's perhaps a better play than some of the stock picks in this extended market.